Yes I am not fully grown up yet, so when I do grow up your all invited to my bubble pool party! A couple times we have been to my buddy Tyler's (Jason Biggs - American Pie look alike) house in the late night/early morning and we have had a bubble bath party (in swim suits). I enjoy this because it is just fun it creates a little bit of a mess but in my opinion totally worth it. So when I do get around to growing up I am going to have a pool and once in a while will throw bubble pool parties; so come on over and let loose in the bubbles of joy! Me and bubbles of fun! Yeah! I loved bubble baths as a kid! 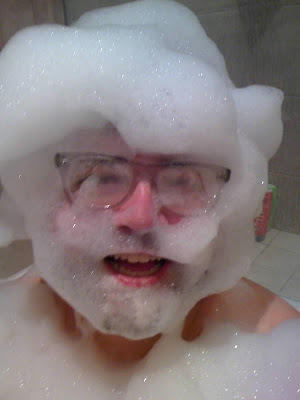 Just so you know, John knows how to make really good bubbles! I hope that its a big tube, kind of like your brother John's tube...that thing is huge...unless its bigger than, even better! But I have to agree with heidi, that does look like fun. My ex, use to work for Extreme Sports and one of their inflatables was a bubble dance floor. It was way cool...this kind of reminds me of it. This reminds me of this Bubble dance floor that they had at extreme sports in orem. But this does look like a ton of fun!